Catch rabbits, stoats, ferrets, rats and other wild animal pests safely and humanely with our Havahart® 1083 Easy-Set® live animal cage trap. 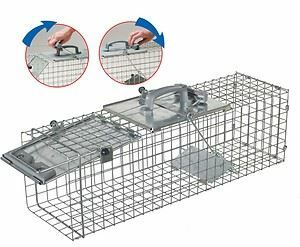 Havahart® cage traps are a safe and humane way to get rid of unwanted pests. Havahart® is the most innovative brand in wild animal control and has been recognized and trusted by consumers for over 60 years! We have Havahart traps that can be used to catch anything from a tiny mouse to a small dog. The Havahart® 1083 live animal trap is made of a sturdy metal with a spring loaded door that securely locks. The trap is made of heavy-gauge sheet steel, and sturdy wire mesh. All Havahart® traps are galvanized for long life, maximum resistance to rust, corrosion and wear. Solid spring-loaded door and handle guard ensure consumer protection while transporting the animal. The Havahart 1083 live animal trap is simple, quick and easy to set in a few seconds. Easy-Set® mechanism allows to set the trap and release trapped animals with one hand. The Havahart® 1083 live animal cage trap has been designed to provide many years of reliable service. It is made of galvanized wire mesh with steel reinforcements. Easy to set: Trap sets with one hand. Easy to release: Lever opens trap door and animal is set free. Safe: Set and release mechansim is located on top of trap limiting interaction with animal. Animal Safe: No sharp surfaces. Proven design: Tested and used by professional trappers. 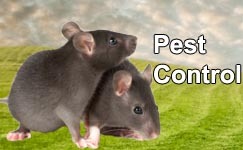 Pest and nuisance animals: Ideal to catch rabbits, stoats, ferrets and others. Uses: Use in gardens, yards, farm fields, garages, basements, camp sites, warehouses, commercial facilities, food establishments, homes and offices, kitchens, boats, sheds and others. To ensure safe and humane trapping of wild animals, choose the appropriate size trap for the animal and check the trap often. To calm trapped animals, cover the entire trap and limit human contact. Check with your local or state Game Commission to determine the lawful method of disposing of a captured wild or nuisance animal. Caution: DO NOT ATTEMPT TO HANDLE CAPTURED ANIMALS. DO NOT LEAVE CHILDREN UNATTENDED NEAR A CAPTURED ANIMAL.